I need to get noticed! The objective of Search Engine Optimization (SEO) is to achieve first page search engine placement for relevant keywords or keyword phrases. Search Engine Optimization is a process which targets first page placement on major search engines for keywords and keyword phrases relevant to your website. Natural Search Engine Optimization includes consultation regarding previous marketing efforts, expectation and goal setting, site optimization, Link Building, the Google suite of services, Social Media, and Branding. Developing a social media presence is extremely important in today's ever changing marketing environment and Search engine rankings. Social media sites like Facebook, Twitter, and YouTube allow companies to interact with potential customers through web-based and mobile technologies turning communication into interactive dialogue. Social media is a group of Internet-based applications that build on the ideological and technological foundations of Web 2.0 and is a must for any online business. Search engines judge a website's value or online credibility in part based on the number and quality of other websites linking to it. Quality websites are websites that exhibit high levels of link popularity. The process of improving your link popularity is called Link Building. PositionKing provides a complete suite of search engine friendly Link Services which adhere to the Google Webmaster Guidelines. PositionKing created and uses one of the most comprehensive customer service applications within the search engine marketing industry. This interactive administration and the professional account management team provide a single, reliable, point of contact, daily support, notification of new opportunities within the search medium, and continual progress and status reports. Guaranteed substantial placement among the major search engines using suggested guidelines by each search engine. No gimmicks or unethical tactics are ever used by PositionKing. All Search Engine Optimization techniques are transparent and in accordance with search engine guidelines. A Breakdown of Services by PositionKing, Inc. Using proprietary search engine analysis tools, PositionKing works directly with Clients to develop an ideal set of keyword phrases for promoting the Client website and cross-reference that against the most relevant search terms used by web searchers. 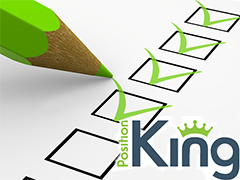 Using Client-approved keywords from the Keyword Research Phase, PositionKing runs extensive search engine ranking reports detailing the current ranking positions of the Client's website among the top search engines. PositionKing uses keywords from the Keyword Analysis report to run ranking queries against Client's top competitors. A discovery process is then conducted on the competitor's placements using SEOmoz and proprietary software to disect the ranking methodology which is considered when determining the perameters used to create a path for successful rankings. Analyzing pages of Client's website found within Google, Bing and Yahoo to determine which sections of the Client site are being indexed by various search engine spiders. This is a critical step before moving forward with page changes. Selection of key web pages for Search Engine Optimization with consideration of relevant keywords to matching subject matter, back links and site navigation. Optimization of these structures include website headers, page naming conventions, internal navigation and other search engine friendly practices for web pages. These recommendations consider user experience and navigation of the site. PositionKing's optimization professionals optimize strategic copy which will add value to the web user experience while providing algorithmic keyword density, keyword placement, and keyword weight, constituting keyword content relevancy. A key element in search engine optimization is proper structure of Title and META Data. Based on the keywords chosen per page, PositionKing will construct search engine friendly page Titles, META Descriptions, ALT Tags, and other edits as required. Internal linking optimization involves text link naming strategy for linking to and from pages within the Client website. Strategic placement of keyword anchor text is placed has an influence on search engine database storage and search retrieval. All code will be delivered to Client in copy/paste format with easy-to-follow instructions, to ensure proper placement. PositionKing can also assist with implementation. Links from similarly themed websites drive relevant traffic to your website. Targeted traffic is more likely to convert into a sale. Additionally, search engines use links when calculating relevancy algorithms. Text links are "active" words on a website (usually underlined), which transport the visitor to a specific website, or webpage, when clicked. Since Text links cause action, they are often referred to in directional terms; such as, "outbound links" and "inbound links". PositionKing helps Client execute a strategy to maximize inbound links with existing web partners. The Client's network can often include buried link popularity opportunities, and PositionKing will work with Client to determine where these opportunities reside. Business partners, company websites, clients, and affiliates may be good candidates for link acquistion. Directory placement is the process of placing your business information in online directories, which are the equivalent of yellow pages and other business advertising phone books. Every directory should showcase your company’s name, contact information, description, products, services, photos, and website address. They can receive a lot of search queries and may offer a link to your website, which helps increase your website’s ranking. 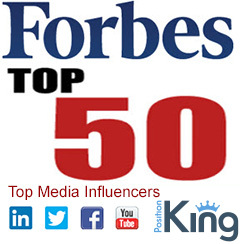 PositionKing has picked the top directories for website inclusion. A confirmation email detailing those submissions is provided. Social media reaches hundreds of millions of people and is a necessity for any complete Marketing Strategy. Accordingly, Google, Bing and Yahoo now give ranking priority to websites linked through Social Media. With hundreds of thousands of high-quality websites, news pages, and blogs that partner with Google to display AdWords ads, the Google Display Network can reach users all over the web to help you drive conversions. PositionKing provides network distribution and technology enhancements for your release. We carefully analyze your release and optimize it around key search terms that increase your online visibility. Creation of Google Account, Google Analytics Tracking Code, Webmaster tracking installation code, and creation of Google Places and a review. Creation of Google+ Features, including Account, Circles, Community, Google+ Business Pages, and messaging. Get found across Google, right when your customers are most interested. Your page, along with your profile image and recent posts, is eligible to show on the right-hand side of Google's results when relevant to a customer's search. Blogging is a simple avenue for non–coders to place their message online. Many blog services are even free for casual or non–demanding professional users, and many individuals and companies use blogs for free marketing. Posts can be created as product reviews, articles, news or other. You can also link your blog to your corporate or sales sites. Google, Bing, and Yahoo take well written blogs into consideration when ranking websites. Creation of Infographics. Tell your story, drive traffic to your site, and increase your presence on social media all with data visualization, other known as Infographics. The PositionKing graphics team will create a custom, distinguishable infographic for you, incorporating your message and brand. It will be submitted to specified sites for instant viewing and sharing across the web universe. PositionKing™ provides the client with a single and reliable point of contact, responsible for communication, the coordination of code and content implementation, and any necessary re-optimization based on changes within search engine algorithms and/or adjustments to link strategies if applicable, notification of new opportunities within the search medium, and continual reporting and requirements analysis. PositionKing™ uses its own proprietary SEO Management system which coordinates all aspects of each project. Sophisticated program applications alert support managers when client pages are not loading properly, have incorrect tags, or drop in rankings. Files, notes, and reports are kept in a central location. Thank you for the outstanding service. I went from nowhere to number one. Excellent service I highly recommend. Thanks for the good work. PositionKing represents years of experience using proven practices and standards for successful search engine placement through natural search engine placement and through paid search engine placement. PositionKing, Inc. employs the highest level of ethics in all search engine marketing operations and works within individual guidelines published by various search engines. Further, PositionKing.com has proven to be a useful tool for search engines by helping to prepare websites for inclusion readiness. PositionKing, Inc. is a trusted business partner, maintains a leading foothold in the search engine marketing industry and provides proven solutions for search engine marketing. Search Engine Optimization executives of PositionKing have been corner stones of search engine marketing since the 1990's, continue to raise the bar within the advertising community and established many early search engine marketing standards which can still be seen throughout the industry. PositionKing stays in front of the Search Engine Marketing industry curve and utilizes many recent technological advances which allow for enhanced user search term analysis. Understanding your audience allows focused marketing thereby attracting a highly qualified visitor through search. In addition, several older methods of search engine marketing are no longer optimal and the constantly changing Search Engine Optimization and Social Media Environment requires ongoing research on a daily basis for optimized search results. Our goal is to increase your exposure across the web in the quickest and most cost effective manner throughout Social Media and within Google and other major search engine guidelines. We feel confident you will benefit from our experienced approach in Search Engine Optimization for Natural Search Engine First Page Placement, and Social Media Setup and Optimization. As always, customer service is our top priority. Using proven techniques and a topnotch success rate, PositionKing™ can take your website from nowhere to everywhere.